On 31 May 2017 the European Commission launched a set of proposals – the so called Mobility Package – aimed to make rules simpler, to improve controls, to combat social dumping and unfair competition in bus, coach and road freight transport. Making driving and rest time rules more flexible for the business and more suitable to addressing fatigue, adjusting posting of workers rules to the highly mobile driver profession and curving down on the presence of letter-box companies in the sector stay at the core of this package of proposals. But these proposals will also change the lives and work of professional bus, coach and freight drivers for good! They will have an impact on their pay, on the time spent with their family, on their conditions of rest. Not to overlook the impact of these proposals on road safety and passenger safety as a whole. The ETF has solid arguments to prove that the “Brussels” proposals fail to respond to the real needs of professional drivers. Although in many respects the European Commission made an effort to deal with the problem, the planned changes – notably on the posting of workers and the driving and rest time – do not tick the box! The cabotage activity is also part of the Mobility Package. In spite of the Commission’s effort to halt the full liberalisation of the haulage market, the proposed amendments to the rules have the opposite effect. The European Parliament and the transport ministers of the 28 Member States are currently developing their own positions vis-a-vis the European Commission proposal, before stepping in the formal inter-institutional negotiation process. The ETF and its trade union affiliates needs the full support professional drivers and the public at large – passengers and road users – to influence the process of adoption. To achieve this, the ETF launched an information campaign in parking areas distributing information brochures to professional drivers. 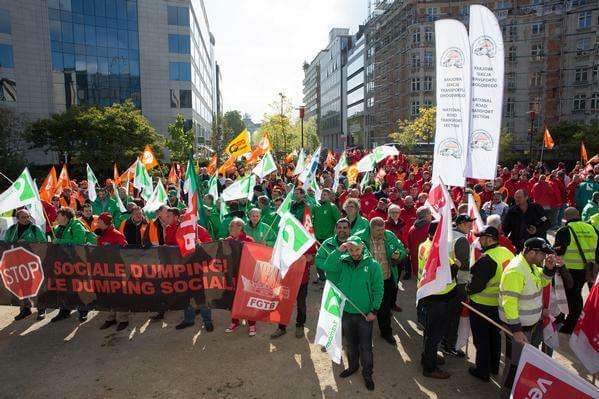 We and our affiliated trade unions will organise an action week from 20 to 24 of November. To flag up the impact of driver fatigue and job quality on passenger safety, we’ll organise a road safety conference at the beginning of 2018! See below the drivers’ information brochures, together with the ETF position and briefing notes on the Mobility Package. See below the drivers’ information brochures on the Mobility Package. See below the ETF position notes on the Mobility Package. See below the briefing notes on the Mobility Package.